So some of you may have been following me on Facebook and noticed Stikkz Media popping up. 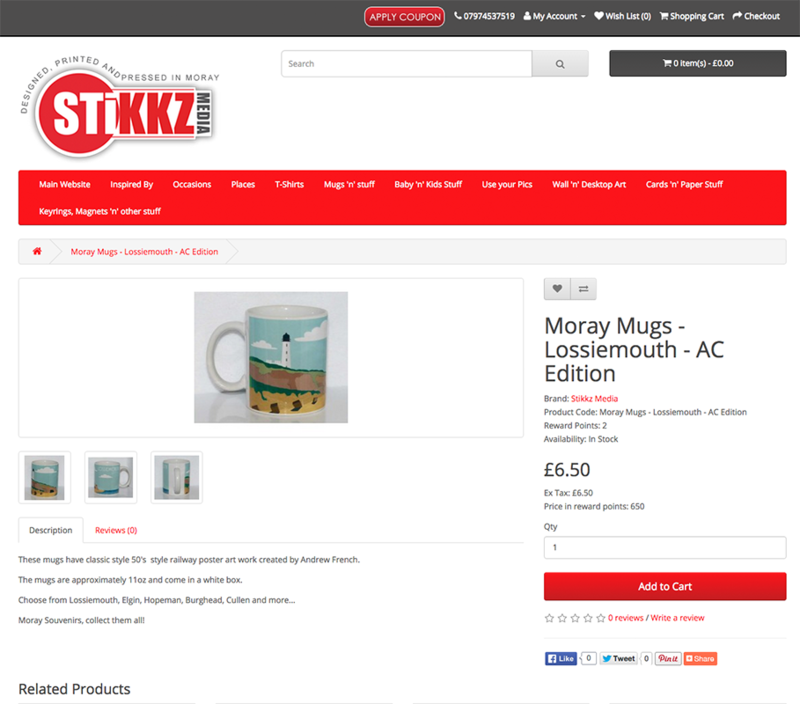 Stikkz Media is part of AJF Web Design and allows me to showcase and sell my graphic design...designs on lots of different items from keyrings and bottle openers to mugs and t-shirts and even rock-slate and tiles. There are some really nice items for sale over at stikkz.com/shop and we also offer personalisation of all items so they are perfect as gifts or for business purposes where you can have items branded up to give-away or sell your self. We already have many of our souvenir items for sale in shops in Cullen, Lossiemouth and Hopeman and are looking to expand over the next 12 months into many other Moray towns and villages. The souvenir items are designed along the style of 1950's railway posters, I try and take a landmark from each place and draw a vector based image using flat colours and one gradient in the background. These drawings were actually inspired after creating a wedding invitation design for my friends Shaun and Laura, so thank you MacFinze!